The Acting Garda Commissioner Dónall Ó Cualáin has written to the Minister for Justice passing on the concerns of a senior official about the operation of the Disclosures Tribunal unit within the gardaí. The unit is responsible for co-ordinating documentation for the inquiry. It is understood the letter was sent under Section 41 of the Garda Síochána Act, which requires the Garda Commissioner to bring significant developments to the Minister's attention. It was sent this week. The issues were raised by the head of Garda Human Resources John Barrett, who is concerned that the unit is not representing all gardaí at the tribunal. He has said that the unit should have been outsourced so that coordination with the tribunal is handled externally. A garda spokesman has confirmed that the Acting Garda Commissioner wrote to the Minister for Justice Charlie Flanagan under Section 41 to bring to his attention an internal concern raised with the Acting Commissioner, relating to the Garda Disclosures Tribunal Coordination Office. In a statement, the Department of Justice confirmed it had received a Section 41 letter this week in relation to the Disclosures Tribunal. It says the matter is receiving careful consideration within the department. Last week, Mr Barrett told the Public Accounts Committee that he had raised concerns about the unit. He said his issues went beyond resourcing and he had written a number of letters setting out his views. Two retired gardaí have been given contracts to work at the unit while another member has been seconded along with an officer in each garda region. Labour TD Alan Kelly has said he has deep concerns about the unit and it must be shut down. He said he has been raising this with the minister in a series of 25 parliamentary questions since May and he called on the minister to deal with it immediately. 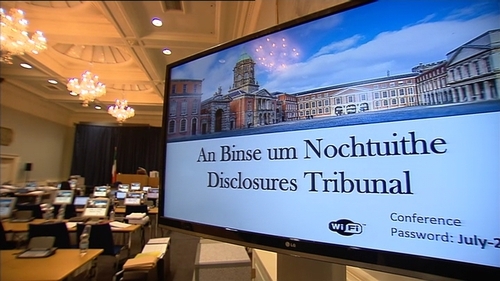 Garda compliance was also criticised at the Disclosures Tribunal when at a late stage, gardaí submitted several relevant documents in relation to whistleblower Keith Harrison. Chairman Peter Charleton requested that gardaí submit an affidavit on the methodology of their searches for the tribunal. Garda Harrison's lawyer called for full and proper searches to be carried out.